If you’ve read any of my other posts, you know I’m hardly a tiny wee thing, and the clothes I buy at the thrift store are often too small. But, I always try to “expand” them with a design tweak here and there. I bought a denim skirt at Goodwill thinking I might possibly squeeze into it – OK, scratch that idea! I thought I’d go for a contrast – after all, if I’m going to add a panel, I might as well make it obvious. I cut up the CB seam, and added in a wide strip of black denim. 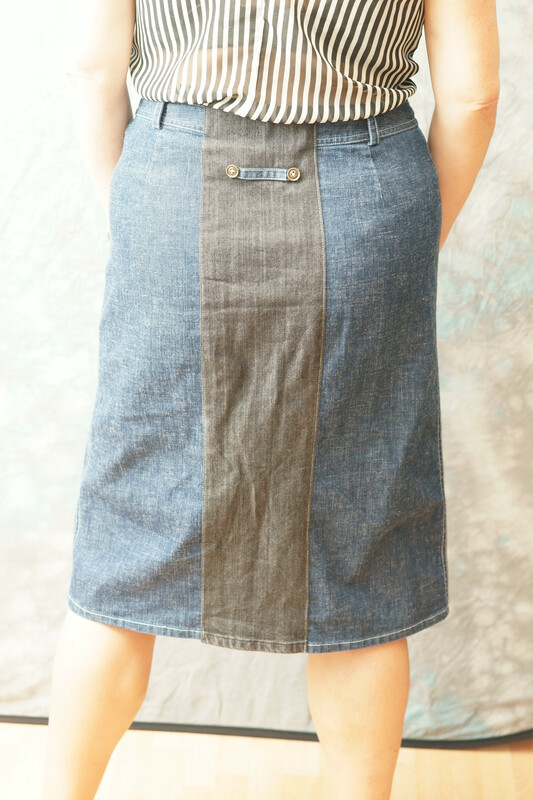 The front had a slit that was a bit too revealing when sitting down, so I used a rectangle of the contrast denim, and stitched it behind the slit, making a kind of “faux” pleat. As a finishing touch, I stitched the CB belt loop back on, but horizontal, with a couple of metal buttons. Posted in Uncategorized and tagged denim skirt, jeans skirt. Bookmark the permalink. Thanks, Helen, I appreciate your comment – I was hoping the belt loop would tie it together, so the back panel wouldn’t look out of place!